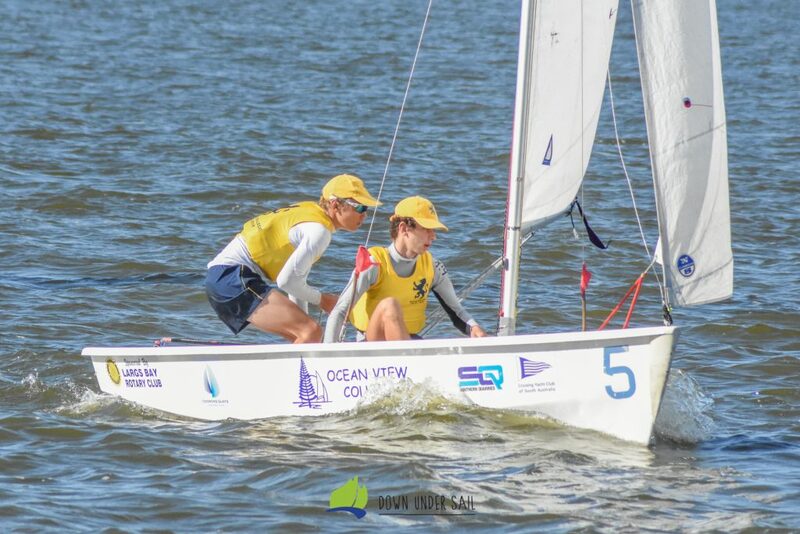 After two days of intense racing with challenging winds, the Westminster Schools second team currently sits atop the table at South Australia’s biggest youth sailing event. Following an exciting victory against their school’s number one team, Westminster 2 went undefeated through the second day of racing to head into the final day in a dominant position. 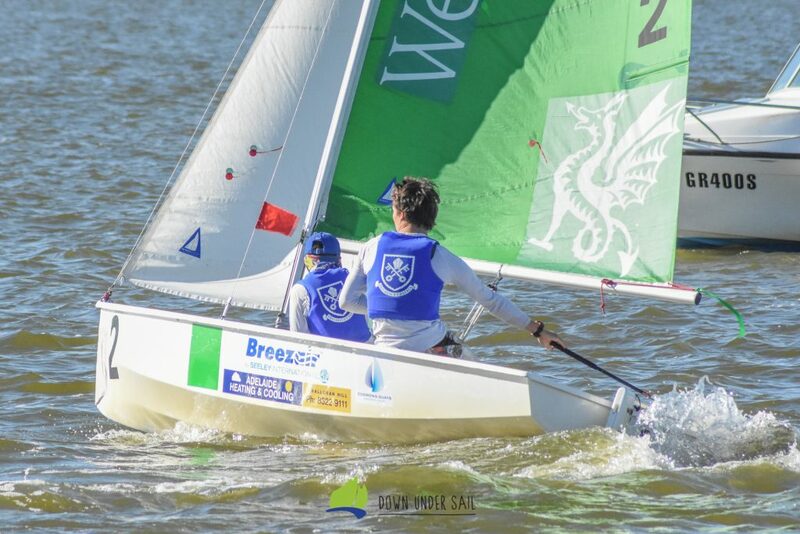 The regatta has seen a total of 27 teams, two of which have made the trip from Sydney with reigning national champion and runner up school Scots College bringing both their teams over. Both days of racing have seen lengthy postponements in the mornings as the breeze has struggled to settle in consistently with directions ranging generally from the north, right round to the west. 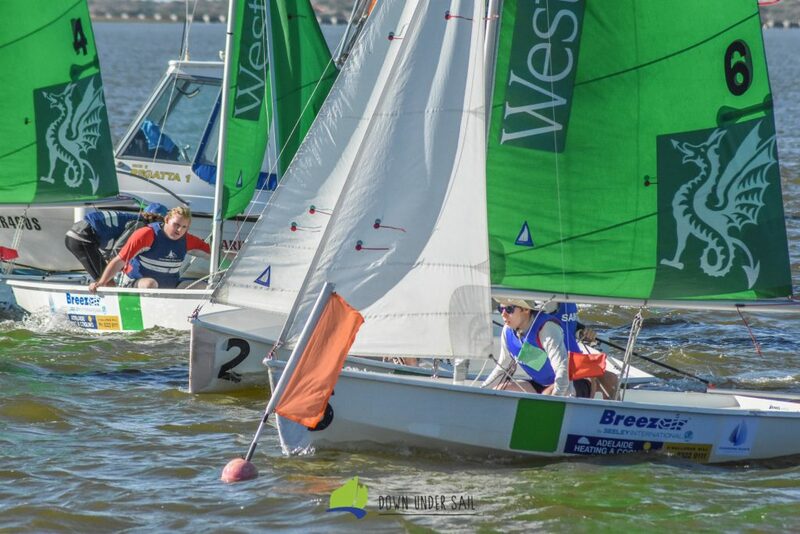 What has been a massive positive about the hosts, Goolwa Regatta Yacht Club, has been the outstanding vantage point for spectators with hundreds of sailors, parents and interested people lining the outer edge of the club’s marina – nearly within arms reach of the action. Concordia and Investigator 1 look like the dark horses as they sit just outside the top bunch and will be looking to give today a red hot crack if they want to be a chance of making the finals. After the 10th round, Westminster 2 were trailed by Westminster 1 in second, Scots 2 in third, Westminster 3 in third and Concordia 1 in fifth, followed by a log jam of five teams all on six wins apiece. The racing will be fierce today with all eyes on the top four finals series this afternoon, which will be LIVE STREAMED VIA THE DUS FACEBOOK PAGE.